For many of us, the significance of Mahashivratri is beyond our own understanding and perception. But just being in Sadhguru’s presence for this evening, for 12 hours straight, our hearts could not help but spill over with love and gratitude. What a week! The seven-day Yaksha festival of music and dance culminated in the all-night Mahashivratri 2019 celebration. Lasting a staggering 12 hours - from 6 pm Thursday until 6 am Friday morning - the Mahashivratri grounds were flooded non-stop with music, dance and the blissful presence of Sadhguru. Millions tuned in worldwide via telecast and webstream to be a part of the event. Sounds of Isha kicked off the evening with a joyful array of tunes, sending a warm welcome to all those arriving. A feeling of anticipation for the big night pierced the air. By 6:45, the music switched to the turbulent drums and exciting tribal dancing of the Mysore Drummers. Moments later, Sadhguru arrived, and the performers amped up the beating of the drums to their utmost level of intensity - making all our hearts pound in unison. The crowds cheered with excitement - the night had officially begun! The artful Sufi music of the Wadali Brothers ensued, sending us all into a meditative state of awareness, followed by heightened states of ecstasy. The Wadali Brothers, who come from a lineage of Sufi musicians, sing freely as a homage to the divine. They believe that spiritual heights can be attained if one sings unreservedly, and indeed, it was a night of harmony for all those in their presence. The pinnacle came during their final piece, “Mast Kalandar”, which got the crowds out of their seats, dancing and clapping to the ecstatic heights of the vocals and instruments. Some people are wondering why it is today and not yesterday. That is because this year, Shivarathri started yesterday at midnight and will close at 4:00 am tomorrow. Those who worship Shiva for boons, for wellbeing, for health, they choose the morning sandhya-kala. Those who seek ultimate liberation, they choose the evening sandhya. Normally, we celebrate Mahashivrathri in such a way that we have all the three sandhyas of evening, midnight and morning. But this year, we have only two sandhyas, the evening is over, the midnight is coming. We want to make best use of this sandhya-kala, this period of transition, which is most significant. The midnight meditation followed and Sadhguru led us all through a powerful energy process. The entire grounds became still as meditators absorbed this influx of energy, which made them attune to the downpour of Mahashivratri. The meditations intensified with passionate chanting and then spilled into the powerful Pancha Butha Aradhana Arati by the Brahmacharies. Fire dancing and the pounding of the drums again lifted the night to a new level of excitement. Sadhguru then beautifully chanted “Mahadeva”, it was a state of enrapture, and Sounds of Isha joined in with vocals and instruments. 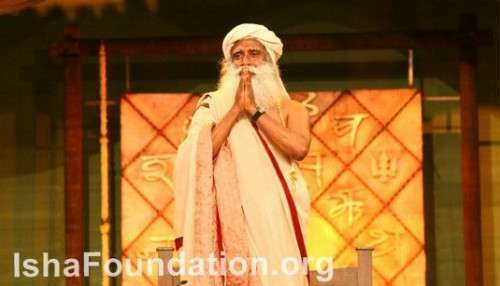 Sadhguru then took questions as they came in live across the world through Google Moderator. We were ready to dance the night away. Next up was percussionist Bikram Ghosh. His mix of Hindustani classical and fusion was mesmerizing and he entertained all of us by weaving humorous stories into his lightning speed percussion. At 3:30 am, world music pioneer Prem Joshua set off some incredible blends of music inspired by both Eastern and Western styles. We couldn’t stop dancing! And of course, our own Sounds of Isha played the familiar tunes that got all of us jumping to the sky and singing in unison. By 5:45 am, the crowds refused to let the evening end and chanted “Sounds of Isha” repeatedly. They got their way and Sounds played a few encore performances much to our delight! Sadhguru then took the stage and closed the festivities with Mahadeva chanting. The standing crowds held their hands together and focused on the master, unable to let go of his presence. During the entire night, he took care to make sure we all remained awake and alert to make use of the energy possibility. He danced and clapped with us, and playfully raised our spirits and encouraged us throughout the night to stay awake. As he walked down the ramp to be closer and embrace all of us, we could only express our tremendous gratitude with tears. In closing, Sadhguru led us all in the powerful “Shambho” chanting and asked us to remain with the chant. For many of us, the significance of Mahashivratri is beyond our own understanding and perception. But just being in Sadhguru’s presence for this evening, for 12 hours straight, our hearts could not help but spill over with love and gratitude. Despite what was happening on-stage, the magnetic pull was Sadhguru himself and none of us could take our eyes off him. Just being with him on this very important night was such a beautiful and a wonderful opportunity. Sadhguru chats with Subroto Bagchi at TiECon, about entrepreneurship and the Indian economy.